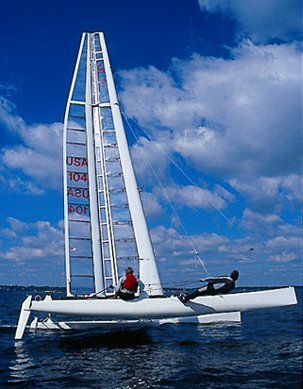 C CLASS CATAMARAN rule began with the creation of the International Catamaran Challenge Cup, first sponsored, in 1960, by the Sea Cliff Yacht Club, located in Long Island, NY USA. The event, loosely called the Little Americas Cup, continues to this day, although only intermittantly in recent years. Among development classes, it is recognized as one with the fewest restrictions. Boats that are built to the C Class rule are among the most advanced and fastest sailboats in the world for closed course racing. There is no restriction on weight or design of foils. The photo is of the US boat 'Cogito'. Photo by Elizabeth B. Wrightson.